Beware RichmondFG is a Non-Regulated broker. It is NOT SAFE to trade. Is RichmondFG a scam or legit broker? No, it is not safe to trade with RichmondFG. 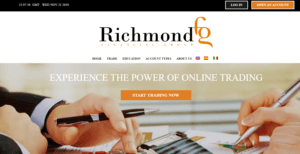 RichmondFG is a broker that offers forex currency pairs, stocks, commodities, CFDs, and indices. The company is owned and operated by Elit Property Vision LTD with the registered address in Sofia, Bulgaria. 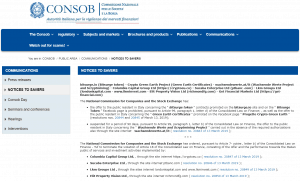 However, the broker is not authorized or regulated by the Financial Supervision Commission in Bulgaria or any other regulator. Forex and CFD brokers are required to have a license by the local financial authorities in order to offer and provide financial services. RichmondFG doesn’t carry such license, so it cannot be considered as a reliable broker to invest with. Also, previously the broker has been banned by German BaFIN, however, back in 2018, there was a different company behind the brand’s name, Terraquest Media Ltd.
We advise all investors and traders to avoid RichmondFG and other unregulated brokers. The lack of information about the broker’s regulation, trading conditions, and contact details should be the biggest red flag for those who plan to invest with the entity. Usually, such companies run investment scams. Traders should trade with well-regulated brokers such as UK brokers or brokers in Australia and reliable brokers such as eToro and XM.com.